Just what the doctor ordered. He said to get a contoured pillow to support my neck to decrease the cervical pain I kept having at night time. This one did the trick. The open cell technology of this contour pillow allows for unique sleep customization. The European styled luxury circular knit is soft to the touch, but durable to extend the life of the pillow. 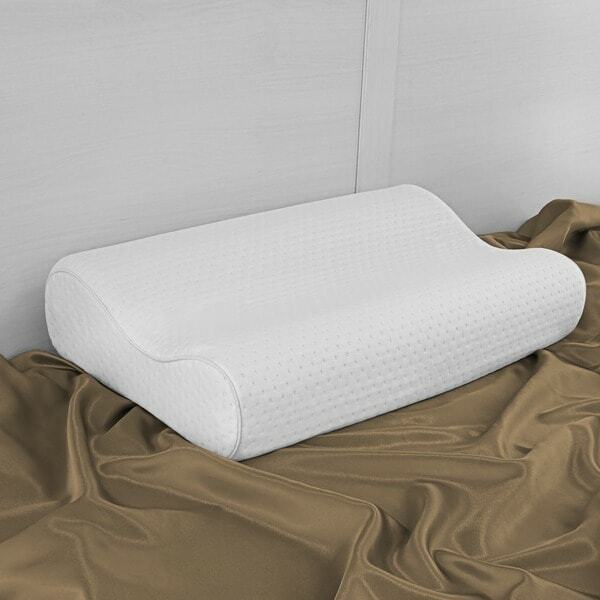 Hypoallergenic to resist dust mites and naturally antimicrobial, this memory foam pillow features a dual-height contour to cradle your head and neck in cool softness and comfort. A 15-year limited manufacturer's warranty is included for peace of mind. Shipped in a compact form, this pillow quickly expands to size within 48 hours. The support my neck gets is great, and it is way more light weight than a similar Tempurpedic pillow that I used for 10 years. However, no matter what I do, I cannot get the awful odor of this pillow to go away. It is very strong. I left it out of the package for over a week, sprayed it with Febreze, left it outside in the sunlight.....basically everything I could think of to expedite removal of the odor. It's still there after three weeks and it's still smelly. But if chemical odors don't bother you, then this is the pillow for you! I do not recommend this pillow to anyone who has a neck problem. The foam goes flat, no support at all. The workmanship, quality, materials, etc. are all fine. The foam is too soft and not supportive. This turned out to be a flat pillow. Very disappointed. This pillow is awesome! So comfortable. I am very pleased with this product. I use it at night with my Cpap machine and I'm sleeping great. It really reduces my neck and back pain every day! The pillow even has cool technology. Once again Overstock offers fabulous prices. This contour memory foam pillow does the trick for me. I have a neck issue and need to sleep on this type of pillow as it offers support in the right places for me. Good quality &amp; fits perfectly in a standard sized pillow case. This is a great pillow. It's one of the best ones i have found in a memory foam pillow. You don't wake up with a sore neck. I love this pillow!! I've had neck pain for years and always blamed it on poor posture. After reading several articles I decided to try switching to a contour pillow and it has helped tremendously! I no longer wake up with neck pain anymore. I wish I would have bought this a long time ago. I highly recommend this pillow! It is very comfortable. I like it. But note, it is small like regular standard pillow not as advertised. It is on the softer size so if you need that heavy foam it won't do. It is perfect for me. I don't have a neck injury but I would imagine this would work softer not harder? I just needed more comfort to sleep. It's a keeper for me. I bought this brand bed mattress years ago and it was a great product. This pillow has helped my husband with his neck problems. Now he can sleep thru the night without any pain. Would highly recommend this pillow. I love this pillow. Great neck support. My husband loves this pillow. It has helped so much with neck support and limited snoring. So perfect for my son. He loves these pillows. I'm so glad I purchased these!! I bought two of these pillows...love that they are large and fit on my bed..very comfortable!! I wanted to get another Memory Foam Pillow. I purchased my last one from OS and was very pleased with it. Hope I have good luck with this one.